Special Containment Procedures: Only personnel who submit a formal request and receive approval from site command may operate SCP-2914. SCP-2914 is to be stored in locker 2109-B when not in use. Description: SCP-2914 is a glass-fronted wooden cabinet, 66 cm in height and 38 cm in width, composed of unremarkable materials. The cabinet contains three glass shelves. The back of the interior of the cabinet is a mirrored surface. The cabinet contains twenty-two stoppered glass bottles, each with a capacity of approximately 0.1 liters. Under normal, non-testing conditions these bottles are empty. SCP-2914's primary anomalous attribute manifests when a human subject physically touches the glass front of SCP-2914 while specifically recalling a particular memory. 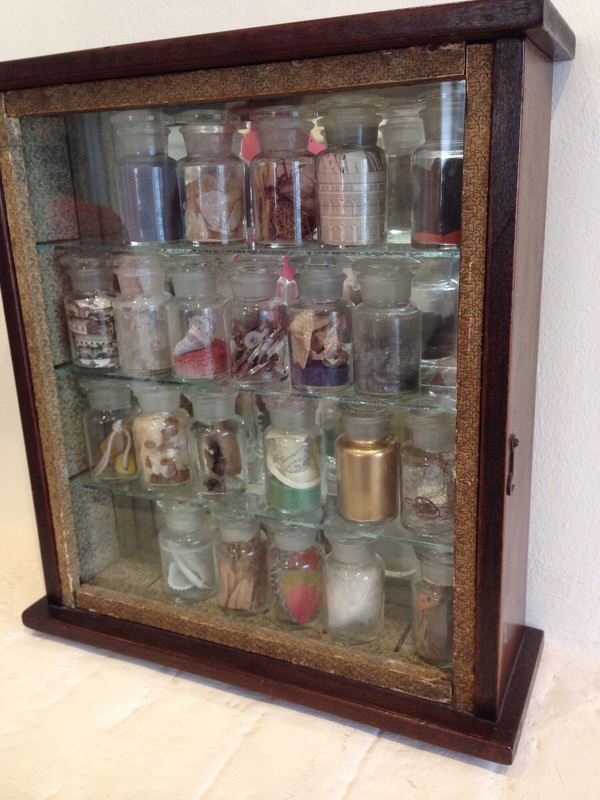 Under those circumstances, the glass front momentarily becomes opaque, then transparent again to reveal that some or all of the bottles within the cabinet have been filled with various substances. Description of Test: Subject was asked to recall a pleasant memory. Subject stated that he would think of a trip that he had once taken to Key West, Florida. Description of Test: Subject, a military veteran, was asked to recall an episode during his combat service in Chechnya. Description of Test: Subject was asked to recall her earliest childhood memory. Subject described earliest memory as a kindergarten playground incident. Description of Test: The 1993 film Gettysburg was exhibited to subject. Subject was asked to recall the film. Off-brand cola consistent with beverage consumed by subject while viewing the film. Description of Test: The 1993 film Gettysburg was exhibited to subject. Subject suffers from schizophrenia and indicates a diminished capacity to distinguish fact from fiction. Subject was coached to believe that subject had personally witnessed the events depicted in the film. Note: It was an avenue worth exploring. Description of Test: Subject was awakened from REM sleep and asked to recall her dream. Subject reported experiencing an anxiety dream about having failed to study for a high school examination. Result: Single bottle, containing strip of cotton sheeting consistent with subject's cot in Site-22 D-class secured dormitory. Note: This appears to be another blind alley. Description of Test: Subject underwent hypnosis and was asked to recall her earliest memory. Description of Test: Subject was asked to recall a memory from the period of time that she was suffering from Leukemia. Note: Subject did not seem to know the names or effects of the chemicals created. This seems to indicate that 2914 has some idea of chemical compositions of different substances. A single bottle with a single smaller bottle which also contained a smaller bottle. This pattern reaches 53 consecutive bottles before ending in a glass cylinder that has no open space. After debriefing D-4962 following the test of SCP-2914, Dr. Morrison inspected SCP-2914 to document the contents of the bottles. In the course of doing so, Dr. Morrison briefly touched the glass front of the cabinet before the bottles had been removed or disturbed. Dr. Morrison reported that he experienced a first-person hallucination which corresponded to the details of D-4962's recollection. Researcher Marcinkiewicz attempted to replicate Dr. Morrison's experience by causing D-5452 (a 52-year old woman) to touch the glass front of the cabinet about an hour after Test 0023 involving D-4962. By this time, the ice in bottle #5 had melted, and portions of the samples in other bottles had been removed for testing. D-5452 reported experiencing a first-person hallucination that involved a bumpy ride for several hours inside a BMP-1 infantry fighting vehicle, following which the point of view exited the vehicle and marched with other Russian soldiers into a barracks. Extensive interviewing of D-5452 regarding the details of the scenery and setting of the barracks indicated that it was located in northern France. There are no historical reports of Russian military forces operating a BMP-1 infantry fighting vehicle or maintaining a military presence in that region. The experience prompted Dr. Morrison and Researcher Marcinkiewicz to commence a separate series of tests. Result: Subject had never visited New York City. Subject reported experiencing a hallucination of a visit to Central Park. Subject's description of some park landmarks differed from their real-world counterparts. Result: Subject reported hallucination of standing on the shores of a sea while several large animals (presumably hadrosaurs, based on the description given) grazed nearby. Result: After recovering from severe nausea, subject reported experiencing the sensation of being a female Crocodylus porosus during the act of mating. Result: Subject blacked out for approximately 35 minutes. When subject recovered, subject reported having experienced the sensation of asphyxiating in outer space. After extensive interviews conducted with the use of hypnosis and nootropic tropic medications, subject was able to describe the environment that she had observed during her experience, which consisted of the interior of an orbital space station operated by the Indian Space Research Organisation, the hull of which had been damaged exposing the interior to the vacuum of space. The Indian Space Research Organisation has not, to date, ever launched a space station. Subject experienced acute PTSD and has been deemed unsuitable for future testing. Result: Subject blacked out for several hours. Upon recovery, subject was confused and distressed and had lost the ability to communicate in English. Over the course of a series of interviews conducted over a period of weeks with the liberal use of nootropic medicines, researchers learned that subject was able to communicate in an archaic form of the Telugu language. Subject, although female, identified as a male and reported that "he" had lived for at least thirty years as a traveling merchant, transporting merchandise overland from the region of Khorasan (central Asia) to the city of Amadomoglu (which does not appear on historical records but according to D-11328's account, was located on the east bank of the Volga River near the northern Caspian Sea. Most of the details of D-11328's report do not correspond to identifiable historical places or events, but the report included an account matching the description of SN 1054 (a supernova in the constellation Taurus that occurred in the year 1054 AD). Subject's last chronological recollection was of a "Daeva attack", after which subject could not recall any subsequent events. Subject had no recollection of her life before the test. Result: Subject reported hallucination of unremarkable events in Site 22's D-class secured dormitory. Four days after test, D-114078 escaped from secured dormitory, apparently by means of successfully impersonating Dr. Morrison and obtaining unauthorized access to Site 22's data files and security center. Dr. Morrison was killed during the escape. D-114078's whereabouts are unknown.